Kyle Joseph Guy, professionally named Kyle Guy is an American college basketball player for the Virginia Cavaliers of the Atlantic Coast Conference (ACC). Today, we will try to disclose his facts including his career, affairs and many more in this biography. 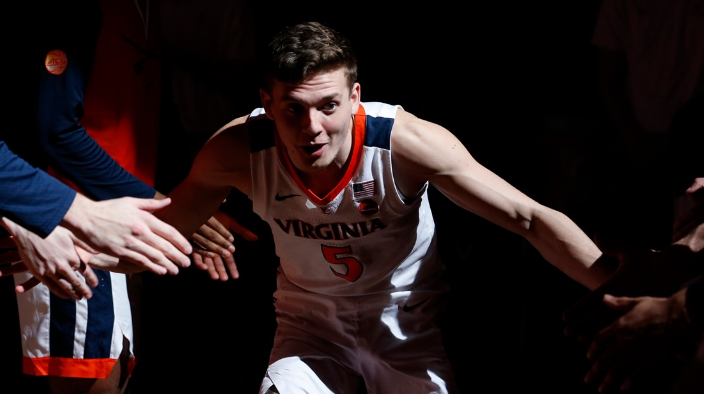 What is Kyle Guy known for? An American professional college basketball player. Where is Kyle Guy grew up? Back to his early life, Kyle was born in Indianapolis, Indiana, United States. He is American by nationality and belongs to the white ethnic group. His parents are Katy and Tim Fitzgerald and Joe and Amy Guy. He has five siblings, three brothers, and two sisters. His great grandfather was the commissioner for the Indiana High School Athletic Association and was inducted into the Indiana High School hall of fame for basketball and football. Regarding his education, Kyle attended Lawrence Central High School in Indianapolis, Indiana. Later, He went to the University of Virginia and as of now, he is a student of DePauw University. When did Kyle Guy pursue his basketball career? Kyle began playing basketball from high school. He was a varsity letter winner all four years at Lawrence Central. On January 18, 2016, Guy was named a McDonald's All-American. After averaging 23.5 points, 5.6 rebounds, and 3.7 assists during his senior season, Guy was selected as Indiana's Mr. Basketball. Back to 2014, Guy committed to playing college basketball at Virginia, selecting the Cavaliers over offers from schools such as California, Xavier, and Indiana. Guy set a new career-high with 30 points against Marshall on December 31, 2018. He recorded his first collegiate double-double with 25 points and 10 rebounds on March 30, 2019, against Purdue in the 2019 NCAA Tournament, helping the Cavaliers advance to the program's first Final Four since 1984 in the process. On April 6, 2019, in Virginia's Final Four matchup against Auburn, Guy hit three consecutive free throws with 0.6 seconds left after being fouled to help the Cavaliers reach their first-ever national championship game. Is Kyle Guy was engaged? Reflecting his personal life, he was engaged his long term girlfriend Alexa Jenkins on Feb. 18, 2018. Kyle and Alexa are both from Indianapolis and began dating when they were in the 8th grade. They attended neighboring high schools in the suburbs of Indianapolis. The couple is very open about their relationship on Facebook and Twitter. As of now, they live a blissful life without any rumors. They seem to be happy. 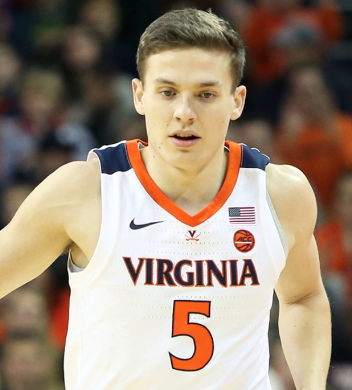 What is the total net worth of Kyle Guy? As a basketball player, he must be accumulated a lot of money from his profession. However, his salary and net worth have not revealed yet. In the case of revealed, we will let you know. According to some online sources, Basketball yearly earnings range between $20,000 and tens of millions of dollars per year, depending on a number of considerations. We assure that he also earn that range. So, stay tuned with us for a new update. How tall is Kyle Guy? Observing his body statistics, He stands a height of 6 feet 2 inches and weighs around 79 Kg. Similarly, He has a pair of dark brown eyes and hair color. His other body information was not disclosed yet. In the case of disclosed, we will let you know.